I have long been excited by Alasdair Macintyre's work on moral philosophy. 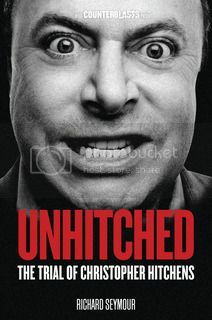 I wrote about his famous essay 'Notes from the moral wilderness' here. 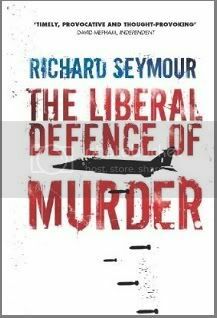 In that essay, he took issue with the 'moral Quixotes' who challenged Stalinism on the basis of an arbitrary individual stance. Rejecting the Stalinist conflation of morality with the laws of history, they opted for the authority of conscience: "Here I stand, I can do no other". But what, a Stalinist might ask, is so compelling about your conscience, as opposed to mine? For Macintyre, this appeal to individual conscience was a leftover of Lutheranism. In the hands of the Lutherans, morality was reconstructed as a series of "divine fiats", "totally arbitrary" edicts that appeared to have no basis in the needs of human communities. With the decline of religion, these fiats were no longer divine, and all that remained was their compulsory but entirely arbitrary nature. This was in stark contrast to the pre-Enlightenment Aristotelianism that, even in its degraded scholastic version, provided a basis for moral thought in human need (cf Thomas Aquinas). Or, more precisely, it rooted morality in “the more permanent and long-run of human desires”. Macintyre hinted here at some of the basic moral problems that have come to define his work, specifically the difficulty of formulating moral questions properly in the post-Enlightenment era. In A Brief History of Ethics, he provided a (Eurocentric, or rather, Hellenocentric) account of transforming moral habits rooted in changes of social structure, from Ancient Greece to modern Europe. Later, in After Virtue, written after he had ceased to be a marxist and had come to view the working class as possessing insufficient resources for solving the problems of modernity, he elaborated his compelling argument as to why the Enlightenment project had failed with respect to morality, and why it had to fail. Enlightenment philsophers sought to rationally ground moral claims, but did so on the basis of an unsustainable normative commitment to individualism. Thus, in Enlightenment philosophy the attempt to derive 'ought' from 'is' always fails. Either one lapses into Humean subjectivism (the default position of Anglo-American philosophy), consigning morality to an unavoidable but empirically unjustifiable sentimental response to the world, or one attempts to reproduce divine fiats at another level, as per the Kantian categorial imperative. For Macintyre, the Aristotelian tradition of deriving morality from a conception of 'human nature' had to be the starting point for any rationally grounded morality. There is an understandable scepticism about attempts to appropriate Aristotelianism for revolutionary socialism, and a justified reticence about grounding questions of political justice in some other sphere (morality, biology, etc). How could one justify conceiving of a 'telos' without a designer, for example? How could one root moral arguments in human purpose, if the very idea of human beings having a purpose is incoherent? Even so, although no 'natural' fact about human beings entails any one particular programme, it is difficult to raise questions of political justice without stumbling on moral issues. For example, theories of justice often rely on the idea of 'desert'. Rawls points out that no one is entitled to advantage on the basis of their innate talents - no one deserves talents, having done nothing to earn them. This is an argument against disingenuous 'meritocratic' justifications for inequality, and it is a good point to bear in mind. The problem with this is that such formulations of 'desert' contain implicit normative claims that require justification in themselves. Why, a social Darwinist might say, should morality be about desert rather than excellence and achievement? Is desert even a coherent category, or isn't every apparently deserved accomplishment merely the result of physiological and social processes that the subject did not create or initiate? Doesn't 'desert' rest on a particularly liberal conception of agency? (Well, that's just off the top of my head, but I'm sure you could think of ways in which commonplace normative assumptions might be problematised). This is why the attempt to rethink morality beyond the horizons of liberal thought is so exciting. My reservations about relying on a concept of 'human nature' to formulate such a morality were partially discharged on reading Dependent Rational Animals, in which Macintyre emphasises our animal nature, and particularly our lifelong dependency and vulnerability. 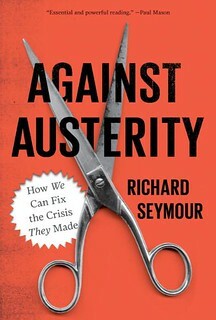 While in a certain version of capitalist ideology (raised to its savage apotheosis in neoliberalism), one is encouraged to relegate dependency to the bookends of life - infancy and senility - and undertake life decisions as a sovereign individual, a moment's thought discloses that our condition is permanently fragile, and permanently needful. Therefore, the mutual, cooperative, selfless and nourishing associations that we concede are necessary in our very young and very old years can be regarded as being desirable throughout life. Knowing ourselves to be animals, susceptible as they are to disease, misfortune, accident and predation, we might conceive of a morality based on a long term collective interest in our well-being, which excludes exploitative or oppressive relations. Well, the above ramblings are by way of a preface to my discovery of a new volume of Macintyre's early political writings, including his period in the New Left and the IS group. 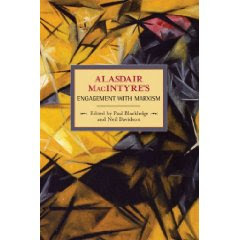 Edited by Neil Davidson and Paul Blackledge, this extraordinary collection, entitled Alasdair Macintyre's Engagement With Marxism, demonstrates the importance of his early marxism to his ongoing philosophical labours. 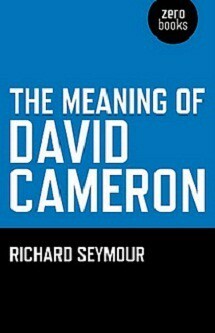 The pleasurably terse and argumentative style that is so familiar in his philosophical writing is forcefully on display in a bewildering variety of contexts - arguments with left reformism, discussions of British capitalism, social democracy, nuclear weapons, Gaitskell and clause 4; thumbnail critiques of figures such as Sartre (whom he obviously admires, but regards as profoundly ignorant of the real situation of the working class - perhaps Ian Birchall can tell us how accurate this is), Marcuse, Lukacs, Mills, Williams and Deutscher; a dissection of the Sunningdale agreement (a 'colonial solution'); theological exposition, etc etc. It also contains 'Notes from the moral wilderness', and extracts from 'Marxism and Christianity' among other important texts. 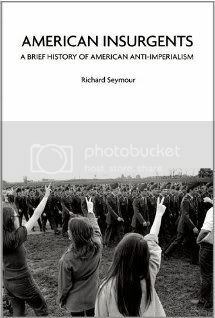 The book is, in a way, a settling of accounts, as the introductory essay makes clear. Macintyre's marxism was disparaged by revolutionaries at the time, who saw his position as leading inevitably toward reaction, and is all too often reduced to marginalia today. Yet it is difficult to peruse his engagements with the problems of liberation in a world bissected by Stalinism and US-led capitalism without seeing how much this early emancipatory impulse drove his interrogations into ethics and morality. 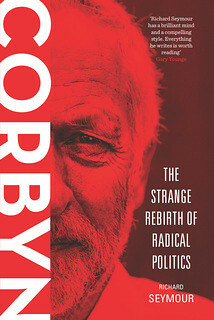 That Macintyre is no longer a marxist, moreover, does not mean he has made peace with capitalist modernity, albeit he is now as likely to be championed by conservative thinkers as radicals. It is actually the very disdain for modernity that continues to give his writing a powerful critical edge.